In the world of memory foam manufacturing, there is a clear and noticeable difference between American made memory foam and Chinese memory foam. Quick Summary: American memory foam will last longer, as a result of almost always being made with 100% visco-elastic memory foam. Also, American made memory foam is produced in a vacuum, giving the product consistency of quality and support. Chinese manufacturers will often add clay fillers to their memory foam that cause it to break down quicker, forming depressions. In addition to this, there is speculation that certain Chinese foams contain carcinogens (cancer-causing agents). Therefore, Rocky Mountain Mattress carries only USA made memory foam. We have elected to carry Bayer Memory Foam and Foamex Memory Foam. 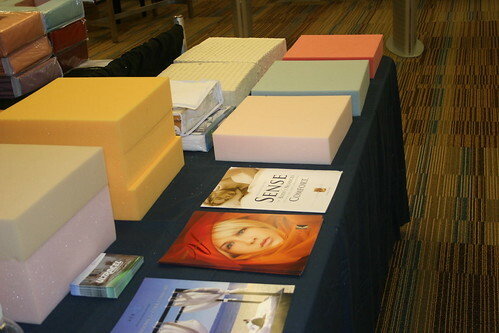 Both memory foam brands are made here in the USA and have excellent reputations for producing quality memory foams that last. Density is an important word in the memory foam mattress world. Memory foam density is an important indicator of durability and performance quality. But a true measure of density depends on who is manufacturing the memory foam and their level of commitment to creating a consistent, quality product. Density numbers have a small window wherein lies the “sweet spot.” High density is generally equated with a quality product, however, there is such a thing as too much density. Two of the main complaints of memory foam mattress owners is the temperature of the foam during sleep or the slow rebound time when turning over—both arguably annoying factors in an interrupted sleep, and both the result of too much density. Usually, mattresses are not a popular import item because of their bulk and the cost to transport them. The advent of memory foam eliminates those problems; its very nature allows for its extreme compression during shipping thus significantly cutting space and cost concerns. Currently, the U.S. is being inundated with Chinese memory foam that advertises “high quality” or at the very least, “adequate” density, but when put into use is turning up questionable characteristics. Some complaints include: slowness to rebound, increased (and unwanted) firmness as the room temperature decreases, hot spots after laying on it for a period of time, oily residue on the mattress surface, and the presence of chemical odors. The chemical smells are most concerning as there is very little regulation of purity or safety in the manufacturing of Chinese memory foam. The smells take a very long time to dissipate (if ever) and have various potentially harmful sources, one of which is the alleged use of pesticides used to kill insects. There is great speculation that Chinese memory foams contain cancer-causing chemicals (carcinogens), another possible odor source. Mattress industry insiders also trade concerns about reports that Chinese memory foam may contain lead, stone dust and clay fillers to fabricate the appearance of a higher density—which commands a higher price. The result of this “enhancement” is a quicker formation of depressions and a rapid breakdown of the foam. The inception of memory foam has a long tradition of bearing high standards as it was first developed for NASA and then used commercially, primarily in health institutions. For many years it was simply too expensive; the manufacturing process remained difficult and unreliable. Today, with our increased knowledge and technology, it has become more widely available. Buying American made memory foam is much safer than its imported counterparts because it is required to meet standardized quality control regulations. Most American memory foam is vacuum-produced, resulting in an even, quality consistency, and yielding a 100% pure visco-elastic foam without the questionable fillers used by other manufacturers. We spend a third of our lives sleeping. For a 60 year old, that’s 20 years! Chinese memory foam may offer a product that carries an enticing discount, but there may be price to pay in quality and an even bigger cost to your health. You can find our made in the USA memory foam mattress toppers at http://www.rockymountainmattress.com/toppers-c-22.html and our American-made memory foam mattresses at http://www.rockymountainmattress.com!/memory-foam-beds-c-21.html.